The highlight of my racing career by far would be my first Isle of Man TT win in 2008. It’s the oldest motorcycle race in the world and I was the first Australian to win a superbike race there since 1976 so I’m quite proud of that. It’s so hard to finish a race at the Isle of Man. It’s a public road course with 250 corners. It’s kind of funny when I look back on it because in 2007 my family and friends made the effort to come over but a week before the race I crashed and broke my collarbone. Then when I won in 2008 I had gone there on my own because everyone had come the year before when I didn’t end up racing. It’s kind of ironic that everyone was there in 2007 and not 2008. What model bike do you have now? I have many motorbikes now because I love motorcycling. I have about half a dozen different bikes. I would say my favorite bike at the moment is a Honda CBR1000RR. How does Warrandyte rate compared to other places in the world you’ve visited? I think of Warrandyte a lot when I’m overseas. It is a really friendly town and the more I travel the more I appreciate that. There’s no place quite like Warrandyte. We’re very fortunate because we have such great roads right on our doorstep. Kangaroo Ground, Yarra Glen, Yarra Valley and King Lake all have great roads. I’ve got friends from all over Melbourne who come out this way just to ride these great roads and see the amazing scenery. What do you think is the most important skill a professional motorcyclist must have? Dedication and commitment. It’s also about approaching the race in the right mental frame of mind, especially with the real road racing where you ride on closed public roads. The danger level is enormous compared to a normal circuit race and there’s very little room for error. You need to concentrate because if you make a mistake you risk injury or worse. Do you think we will see more motorcyclists on the roads in the years to come? 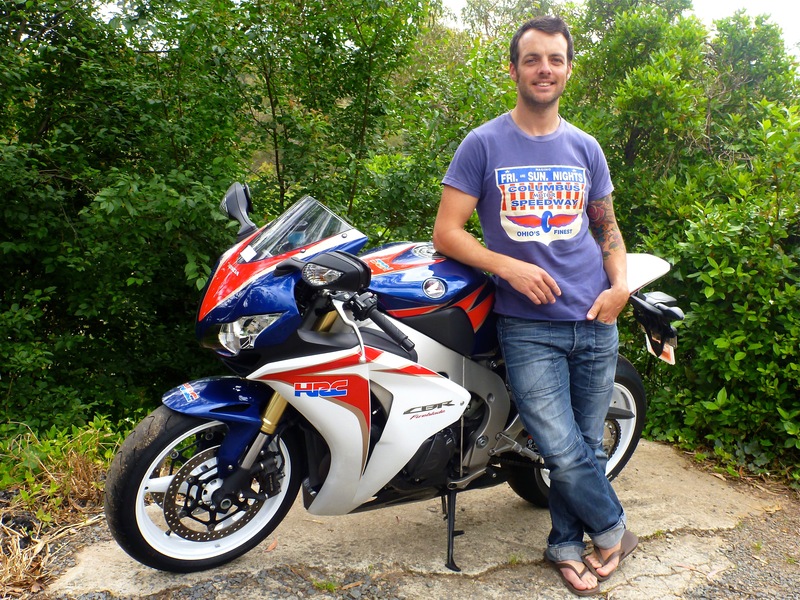 I think people have been a bit scared off by motorbikes but I think more people should give motorbikes a chance and not just see them as immediate danger. I think there’s a stigma in Australia and after travelling around the world I’ve noticed that stigma is not as bad in other parts of the world. Are there any good places where people can go to ride? I still take my motorbike down to my family’s property a bit and I sneak out down there and try not to make too much noise. Now there aren’t too many vacant blocks like there used to be. I think it’s a lot harder for kids now who want to ride their motorbikes because even in a place like Warrandyte there are just not the areas that there used to be. I think joining a club is the best thing. There are several clubs within a half-hour’s drive of Melbourne. Do you plan to continue with racing? It’s hard on my body – the injuries catch up with you. I’ve had plenty of injuries along the way but I guess if I was that easily deterred I wouldn’t have achieved what I have. But I’m still fit and I still enjoy it so next year I plan to go back and race the Isle of Man TT and go to the World Endurance Championship again.